The Largest Edible Fruit Indigenous To The United States Is? Which Of These Groups Was Most Influential In The Early Adoption Of Paved Roads? Despite the fact that they’ve grown in North America since long before there was even a United States to speak of, most U.S. citizens (even those living in the regions in which the fruit grows) have never heard of the pawpaw. 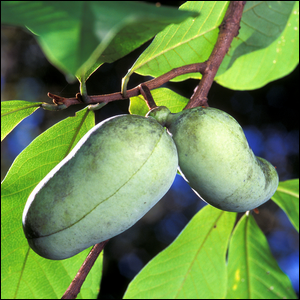 Formally the Asimina triloba, the pawpaw is a tree-growing fruit found throughout the midwest, eastern, and southern United States and can be found as far south as Texas, as far east as New York, and as far north as southern Michigan. The fruit it produces is a long bean-shaped berry that grows up to around 18 ounces in weight. The meat inside ranges from pale to golden yellow in color and has a sweet somewhat custard like flavor not unlike soft banana, mango, or cantaloupe. The fruit is almost entirely wild grown as cultivation, thanks to poor pollination rates and the necessity of costly and tedious hand-pollination, is not particularly fruitful. Furthermore, pawpaw fruit ripens rapidly (to the point of fermentation even) shortly after it is harvested and thus cannot be easily packaged and sold at distant markets.